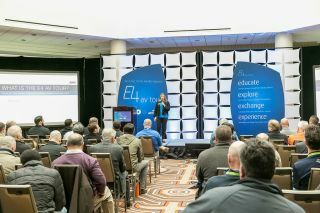 AV distributor Almo Professional A/V, is showcasing dozens of the industry’s newest products on the E4 AV Tour, coming to the Boston Newton Marriott on September 21. “It’s been two years since the tour last stopped in Boston and local attendees will soon discover how much the E4 program has grown and evolved since then—it’s basically an entirely new experience,” explained Melody Craigmyle, vice president of marketing & communications, Almo Corporation. Some of the newest products on display during the Boston leg of the E4 AV Tour include: AVOCOR F2 Series AVF-6550 touchscreen displays, BrightSign Series 4 XD and XT players, Epson Lightscene EV-10 Digital Signage Projector, NEC V864Q 86-Inch 4k Panel Display with RPi, Peerless-AV Xtreme High Bright 492, and much more. E4 Boston is on September 21 from 7:30 a.m. to 4:00 p.m. at the Boston Newton Marriott. The event is complimentary, including parking, for Almo Pro A/V’s reseller, integrator and consultant partners. To register, go to http://shows.e4avtour.com/boston18/venue/. Registration has also opened for the final E4 event of the year, taking place in Nashville on October 25 and 26.